Robert Mayer is an award witaing photojournalist and fine art photographer with an emphasis on sports coverage. Whether covering the seventh Vine of the World Series, an abstract image of the ocean's waves or documenting daily life, the common thread that runs through his work is capturing emotion. 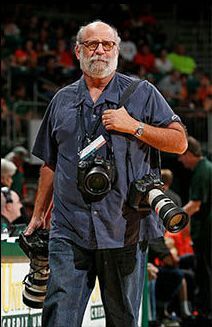 As a staff photographer at the South Florida Sun-Sentinel for 27 years he has won numerous awards in sports, news, features, photo essays, design and photo editing. His work hangs in both the Pro Football Hall of Fame for picture of the year and the National Baseball Hall of Fame. Proudly, he was a team member and Pulitzer Prize &mast for the coverage of Hurricane Wilma. He hopes you feel his commitment to photography when you visit this site.